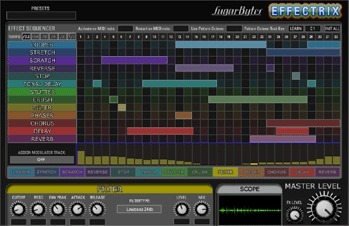 Effectrix, Effect sequencer from Sugar Bytes. 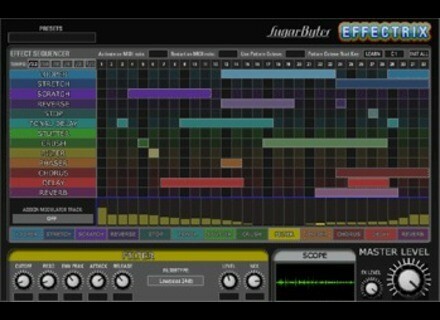 Effectrix 1.4.2 is now available. All known bugs are fixed and a standalone version was added, the company says. All Sugar Bytes products are now available as 32/64bit plugins and standalone version for Mac OS X 10.4+ and Microsoft Windows. vladg/sound Molot vladg/sound has released beta version 0.2.112 of Molot, a new VST compressor plug-in with a GUI inspired by an old Soviet military device. [NAMM] Sonnox Fraunhofer Pro-Codec A collaboration between mp3 creator Fraunhofer IIS and Sonnox Ltd., has resulted in a plug-in designed to change the way audio is mastered for online distribution.